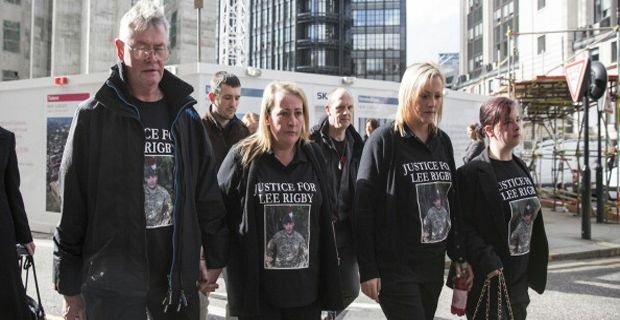 The murderers of British soldier Lee Rigby were sentenced yesterday in dramatic scenes at the Old Bailey. Michael Adebolajo, 29, was sentenced to a whole-life term – a sentence that only recently was confirmed as fully legal by the Court of Appeals despite opposition from the European Court of Human Rights. His partner in the brutal slaying, Michael Adebowale, 22 was ordered to serve a minimum of 45 years in jail. Both men had been convicted unanimously by a jury in December after one of the most shocking crimes in recent memory, and one that penetrated to the very heart of the British psyche. As the sentences were handed down, the judge, Mr Justice Sweeney, labelled them as traitors to Islam. Adebolajo had claimed in his defence that the murder was a military act ordered by God and that he was a soldier of Allah. The judge addressed this in his comments, saying their actions were "a betrayal of Islam and of the peaceful Muslim communities who give so much to our country". Adebowale shouted "that is a lie" at the judge, later shouting "you know nothing about Islam". As mayhem broke out in the court, he yelled "I swear by Allah that America will not be safe." Adebolajo then got involved, shouting "Allahu Akbar" ("God is great") as scuffles broke out in the dock between the defendants and the 9 security guards surrounding them. Adebolajo was pinned to the ground, his legs in the air, before being hauled out of the courtroom head first as Adebowale was dragged out behind him. Outside court the Rigby family welcomed the sentences, saying: "We feel that no other sentence would have been acceptable and we would like to thank the judge and the courts. We feel satisfied that justice has been served for Lee. It just remains to be said: rest in peace Lee."